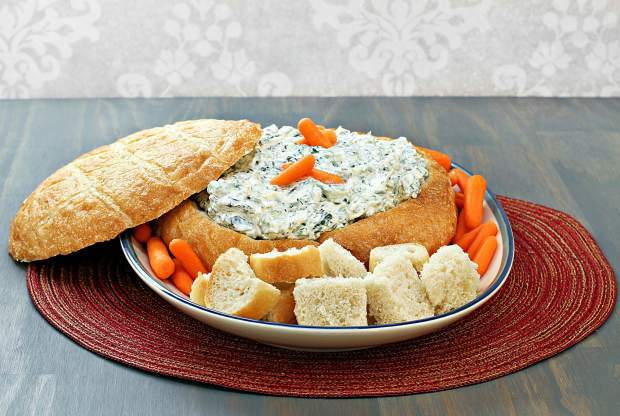 Fresh, delicious spinach dip in a round loaf of bread with bread cubes and carrots for dipping. This time some years ago, a dear friend of mine drove up in the snow to visit me on her birthday. Thrilled to have company, I opened up my cabin to her. At that time I wasn’t a “Food Network” addict, and cooking wasn’t on my favorite to-do list. So, French bread, cheese and bottled water was the plan. 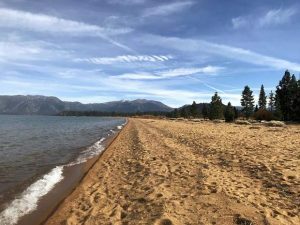 We rehashed our travels up and down California during a book tour for my earthquake prediction book. 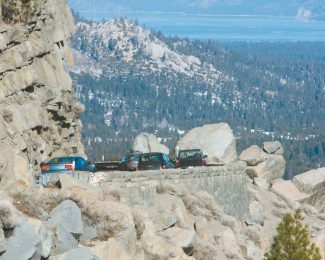 We were certain a shaker was going to hit Palmdale, and I was even on TV, but the Earth did not move that night in the hotel room as we munched on spinach pizza and watched “10.5” — a TV miniseries. This week when I made a spinach dip and sourdough bowl it reminded me of that book tour and how I am preparing to go again — out of the state and country. However, I miss the comforts of home, including the cozy cabin, companion animals, swimming at a pool amid trees in the mountains. In a mixing bowl, combine cream cheese, mayonnaise, yogurt and sour cream. Stir until smooth. Add spinach, scallions, seasoning, salt and pepper. Put in refrigerator. Meanwhile, slice top off bread. With a knife cut out bread to make a bowl. Spoon chilled dip mixture into bread bowl, top with cheese. On a piece of foil place bread bowl, spread it with butter. Set top next to it. Bake at 400 degrees for 20 minutes or until bread is golden brown and dip is bubbly. Serve hot. Cut or break off bread pieces and dip. *You can cut the scooped bread into cubes and serve baked or not. Serves six to eight. This bread bowl full of spinach dip is not only creative, it’s so good. During the chilly days ahead, I suggest making it hot rather than cold. It’s warming, and comfort food with a healthful flair. Put on a pot of tea — black for energy, herbal to relax. And, most importantly, enjoy the skinny dip and fun you’ll have breaking bread with you know who. Cal Orey, M.A. Is an author and journalist. Her books include the Healing Powers Series (Vinegar, Olive Oil, Chocolate, Honey, Coffee, and Tea) published by Kensington. (The collection has been featured by the Good Cook Book Club.) Her website is http://www.calorey.com.